Get back to regular Mom's Demand Action Meetings. Sadly, this was a pretty big fail. They tend to conflict with my school PTA and kids extra curricular commitments, so I may try to shuffle things around in the future since this is something rather important to me. Get plantar fasciitis under control. Thank goodness I took care of this early in the year. I did a pretty crazy treatment, but it WORKED. Eat more fruit. Yeah, I didn't really do this - it would seem I'm just a veggie person. In related news, the new salad kits at Trader Joe's are SCRUMPTIOUS. I could devour the slaw with orange tahini dressing by the boatload. Get six new meals into regular rotation. I'm pretty sure I can check this one off, I got into a good cookbook kick in the second half of the year. Plan the summer road trip and perhaps a girls trip. Check on an awesome Rainier trip and I'm getting in a last minute meetup with girlfriends next month in Nashville! Do the 52 Lists project. Alas, I think this book is more well suited for someone who doesn't make enough lists in her life. As it is, I make plenty of lists - so this fell off the radar. I may have a little fun with it this year, but I'm not holding myself to it. I'm realizing that my goals truly are aspirations that I carry with me all the time, because they mostly revolve around the same things year after year: running, travel, cooking, and number of books. So I'm doing away with all of that and only focusing on bookish goals, with something random thrown in - like the year I made makeup a goal, which was DEFINITELY fun. 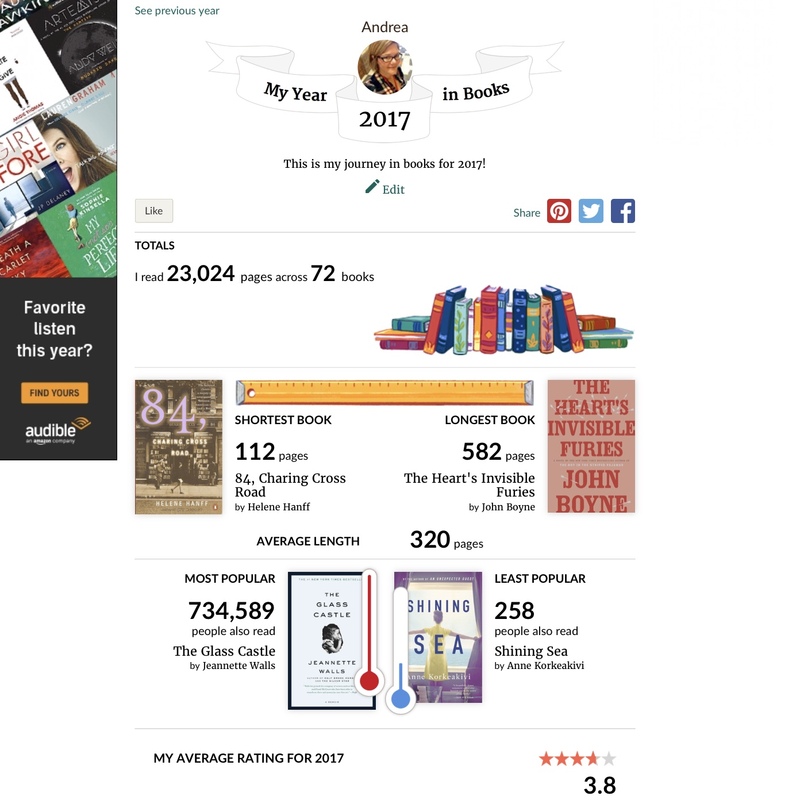 It's also fun to look back at my book stats for the year (here's last year's) when making goals. 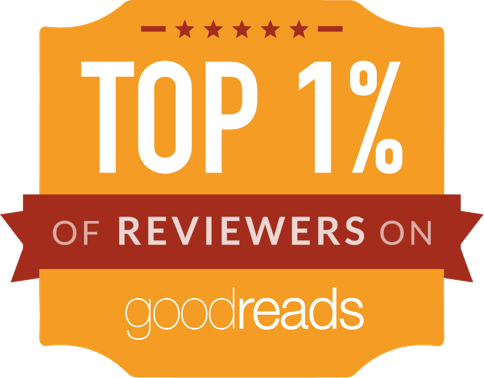 Of the 72 books: 11 were POC authors (15%), 55 written by women (76%), 8 ARCs and 8 audio books each (11%). But, I don't want to dwell too much on the numbers this year. Even though I set a goal for 75 books on Goodreads, I won't be scrambling at the end of the year to meet it - I either will, or I won't. I would like to read more intentionally, and spend time on allll those books I've been 'meaning' to read. Read one book a month from my unread shelf. Yep, those are all of my unread Book of the Month books. I don't think I'm alone in having this pile, and I take comfort in the fact that the 'read' pile is bigger. Alas, I would like to get through them so I feel less guilty about choosing new ones, as well as an assortment of complimentary copies or gifts I have languishing on my shelves. Read War and Peace. Speaking of reading some classics, I'm joining the bandwagon and just ordered my chosen translation to read one chapter a day (after I get caught up) this year. 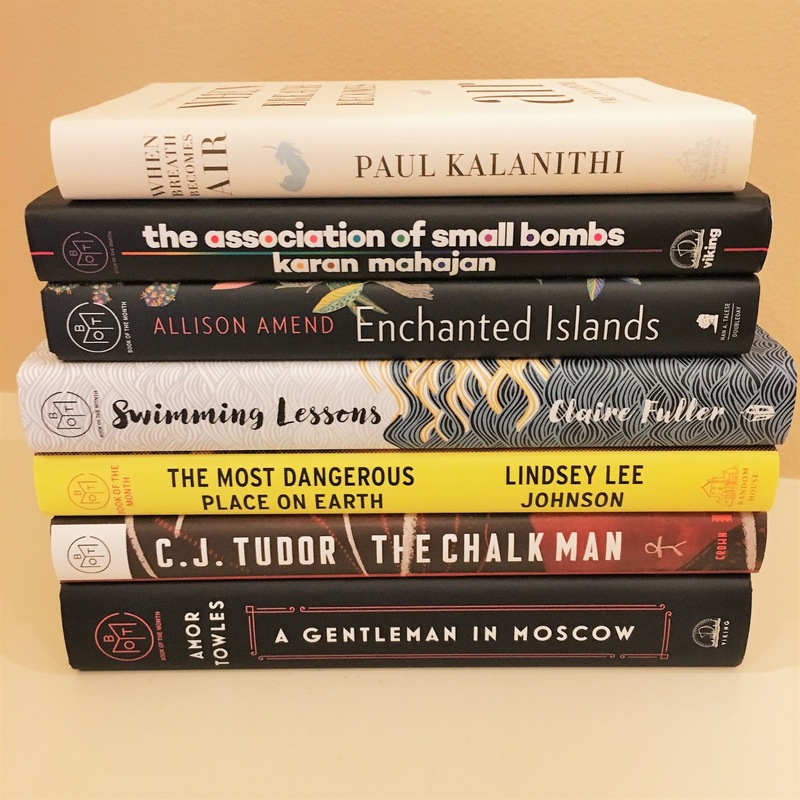 Definitely check out The Ardent Biblio's post on choosing a translation (I went with the same one they chose ). 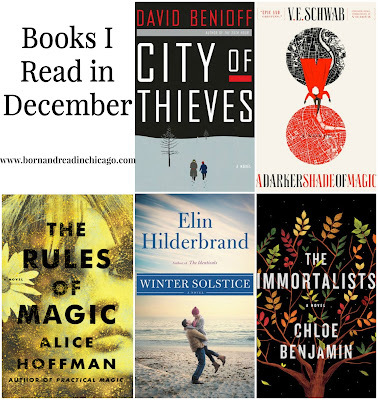 Yep, it's January 18th and I'm just getting around to writing up December reviews! I thought I'd jazz it up a bit with what the kids enjoyed reading over the holiday break, as it's been awhile since I touched upon what they've been reading. 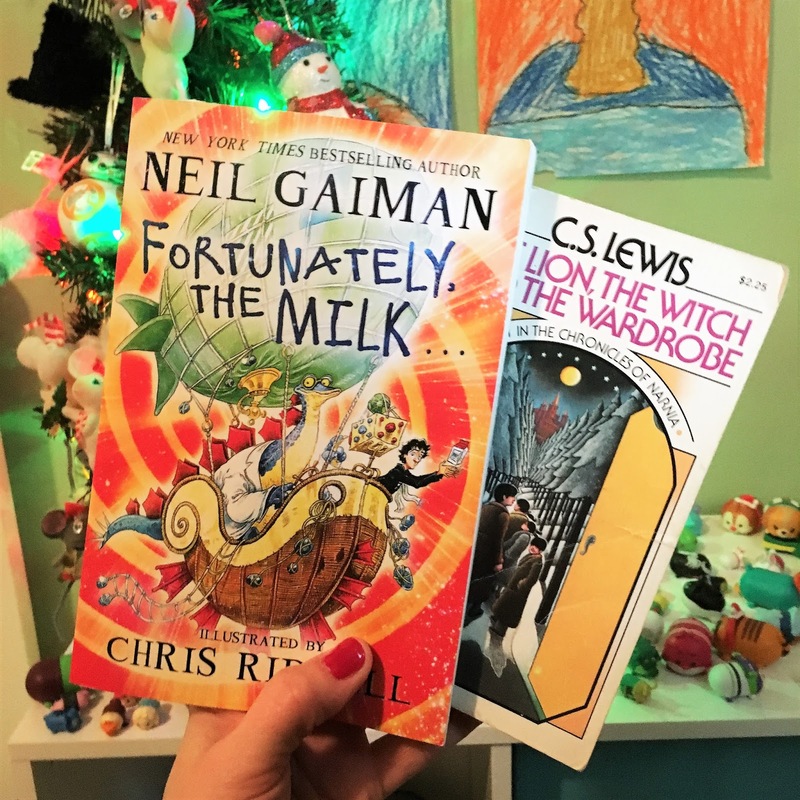 In addition to alllll the National Geographic Kids Chapters books and Magic Tree House adventures, my seven year old has now been introduced to Neil Gaiman and she thought Fortunately, the Milk was ridiculously silly and fun, just like her brother did when he read it a few years ago. And we decided that this Christmas was the perfect time to introduce her to The Lion, the Witch and the Wardrobe : a rousing success, not surprisingly. And, yes, that is my copy of the book from my well preserved childhood Narnia set! 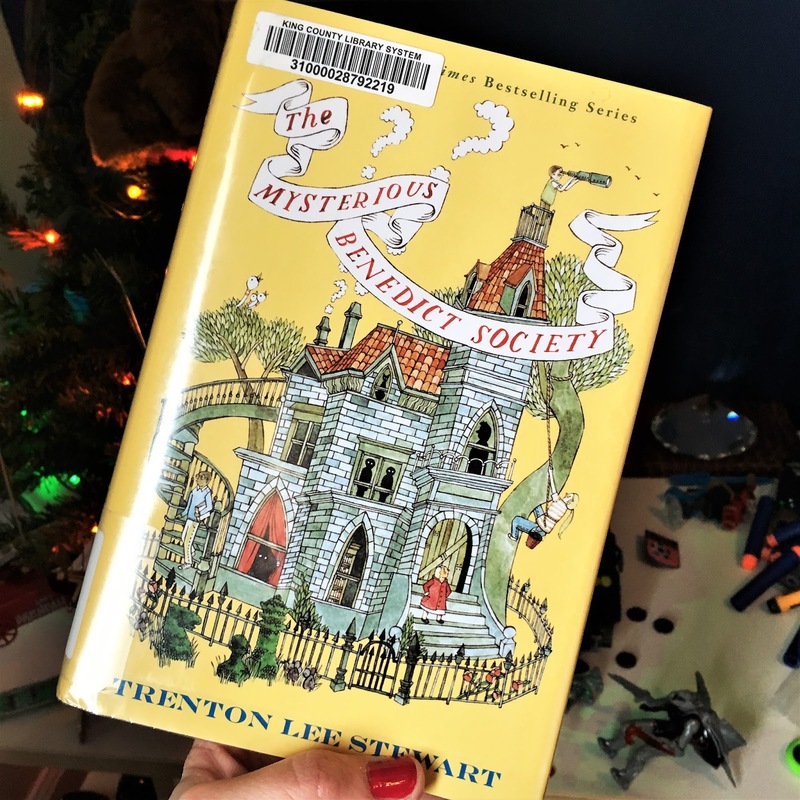 I read The Mysterious Benedict Society along with my ten year old and he really enjoyed it. It starts out fantastic, with great imagination and humor with these misfit kids all coming together to be tested into a secret sleuthing society. The second half dragged a bit for me, but I'm sure it would enthrall the middle grade reader in your house! He's also been enjoying alllll the James Patterson silliness: all the I Funny and Middle School books. This seemed like a good winter read, and it was, if a smidge harrowing! I was curious about Benioff's story telling, as a fan of HBO's Game of Thrones, which he co-created. A young Russian is thrown together with an army deserter during the Nazi seige of Leningrad, supposedly based on a story told by his grandfather, had a similarly visceral feel to Thrones - scenes that were downright horrible, now burned in my brain. The pair's questionable mission (to obtain a dozen eggs for a Soviet colonel who wants them for his daughter's wedding cake) had shades of Saving Private Ryan. It was a sad and sincere read that made really want to know how much of it was embellishment, and how much was true the story of Benioff's grandfather. I finally started the Shades of Magic series, and it's one I think I will continue! It's been awhile since I read a fantasy novel that really grabbed me. The premise of the novels feels original and rife with possibilities: our protagonist, Kell, is only one of two surviving 'Antari' that can travel between the Londons (yes, plural) that exist in four separate universes. The world building is vivid and immersive, while the plot moves quickly and had me turning the pages. I do love the characters, but would love to get more backstory. I felt like I got a good handle on their motivations, but only snippets of their past when I really wanted MORE. Lila is awesome and looks to be on the cover of book two, so I have hope. Practical Magic is one of those novels in which I barely remember the plot, but do remember loving it unconditionally some twenty years ago. Needless to say, I had high hopes, especially with the added hype over this 'prequel.' I'd say that in the first three quarters of the book, I was feeling as if my expectations were not being met. It's a slow burn, to say the least. But, the writing is lovely and creates an equally lovely, albeit somber, atmosphere in which I enjoyed lingering. "Unable are the loved to die, for love is immortality." My heart swelled at the conclusion and made the journey worthwhile. I mean... What more can I say about this series that I haven't said already? Words that are on repeat for my reviews of Winter Street, Winter Stroll, Winter Storms and now Solstice: humor, heart, immersive Nantucket, lovable characters, fun, and perfect light fare. It was fun to learn the origins of the Quinn family books from Hilderbrand's author note, and I look forward to a new winter series with a new family set in the Virgin Islands! 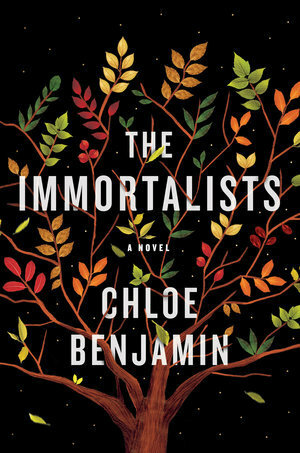 If you follow book social media, this novel has probably popped up on your radar as one of THE essential books to read this year. It certainly drew me in with the obviously intriguing premise of knowing the date of your death. The description gives off a sort of fantastical or whimsical vibe: what WOULD you do? Would you go crazy feeling invincible? Would you check off your bucket list as soon as possible if your day was sooner than you thought? Would you spiral into despair? Far from fantastical, Benjamin weaves this compelling family story with a surprisingly gritty and melancholy tone. "She understands, too, the loneliness of parenting, which is the loneliness of memory - to know that she connects a funture unknowable to her parents with a past unknowable to her child." "Always it's like this: the family that created her and the family that she created, pulling her in opposite directions." The book holds up a mirror, sometimes harshly, to the ways in which we fail to fully live and embrace our lives. There is hopefulness, but it is rather on the depressing side. It would be an excellent pick for a book group with many big themes to dissect on God, fate, family bonds, faith and destiny, to name a few. If for no other reason, it would be fun to discuss the central question of whether you would want to know the date of you own death and why. As for me, that'd be a big fat nope! And if you read the book, you would probably understand why - Benjamin articulates these themes beautifully. Thank you to Putnam and NetGalley for an advance copy in exchange for my honest review!